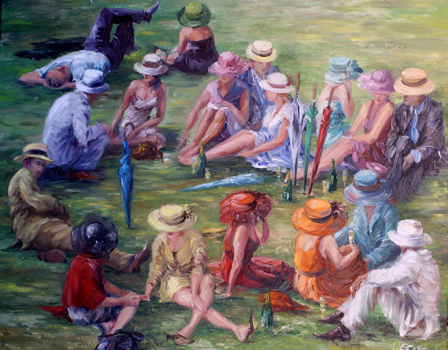 Vibrant paintings of scenes at English racecourses by the brilliant Anglo-American-Russian artist. Elena Eros was born in Moscow, Russia. In 1971 She competed with thousands of other talented young people from all over Russia and won a coveted place at the Faculty of Applied Art, Moscow Textile University, where She studied under renowned Russian Artists. 1973 Elena was awarded an 'Outstanding Student Scholarship', enabling her to continue her education at the Hungarian University of Applied Art in Budapest, from where she gained MA in Fashion Design. In 1980 she was invited to teach in Moscow Textile University, as an Assistant Professor at Faculty of Applied Art. Later Elena moved back to Budapest (Hungary), where she worked as a Fashion Trend Coordinator, Designer, Lecturer and Illustrator in Hungarian Fashion Institute, Portrait Artist in Residence for Hungarian Medical Society, background painter for "Pannonia Film Studios" and was a freelance Artist and an Art Instructor. She moved to Great Britain in 1996 working as a freelance Art Instructor, Artist, Portraitist and Tour guide in National and Portriat Galleries. She later moved to Arizona in 2006, where she won a drawing competition for the American Artist magazine where a portrait study of her father was published in the winter 2006 issue. Elena Eros paintings are in private collections in Russia, Hungary, Great Britain and the USA. Juried Fine Art Show, Mesa Art Center, AZ. 2010 ---- Judeo --Christian International Juried Online Exhibition, Upstream People Gallery, Special Recognition for two paintings, Press Release. Elena is a member of: Oil Painters of America, Arizona Pastel Artists Association, Arizona Artists Guild, Arizona Art Alliance and International Guild of Realism.